I was bitten by the gelato bug about ten years ago and have been making gelato ever since, both professionally, and more recently, at home. When the December 2005 issue of Pastry Art & Design, a professional pastry magazine—now an on-line magazine called Dessert Professional—arrived, I read it cover-to-cover; the whole issue was about Gelato. Although as a restaurant pastry chef I had been making ice cream for several years before that, this was the beginning of my venture into the new (for me) territory of Italian-style ice cream. From the contacts that I found in that magazine, I set out to learn everything possible about gelato. 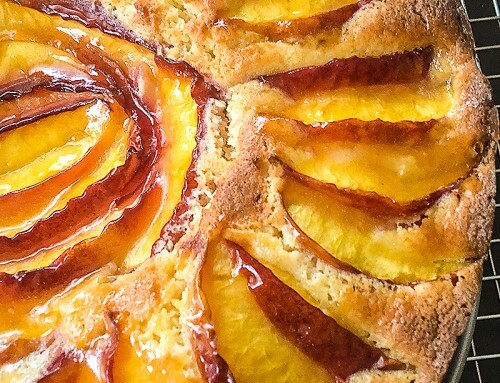 I wish I could say that I went to Italy, studied under a famous and talented gelato maker, learned all of his secrets, and brought them back to The Old Inn On The Green, (New Marlborough, MA) where I was pastry chef, but that’s not how it happened. Although not that romantic—just a lot of hard work—I loved every minute of my gelato journey. My path started by going to gelato seminars, studying books, and making gelato—a lot of it—batch after batch. One of the contacts that I made, Donna Domiano, of Fabbri North America (an Italian company that specializes in professional gelato ingredients), was definitely my gelato guru when I was first learning how to make gelato. Meeting Donna was the next best thing to going to Italy. She was so passionate about gelato and her passion definitely rubbed off on me. I went to many of Donna’s seminars as well as other Fabbri gelato seminars, which were held all over the Northeast: from Providence, RI to Maspeth, NY. I also studied a lot of different books, too many to name, but one gelato book stood out: Luciano Ferrari’s book Gelato & Gourmet Frozen Desserts; A Professional Learning guide (2005). This book was responsible for inspiring me to create my own basic gelato mix, which later led to Shirl’s Gelato Mix. 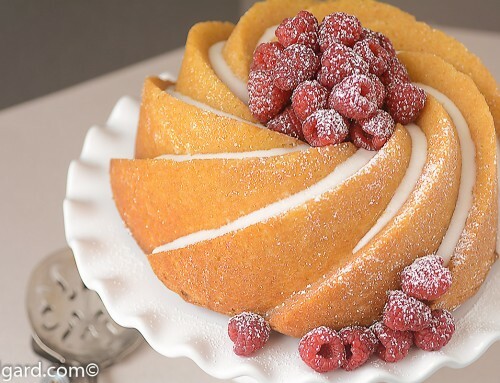 It also inspired me to create many different gelato fruit flavors, just from one romantic-sounding recipe: “Monte Rosa Gelato”, which means pink mountain, also known as Strawberry Gelato. 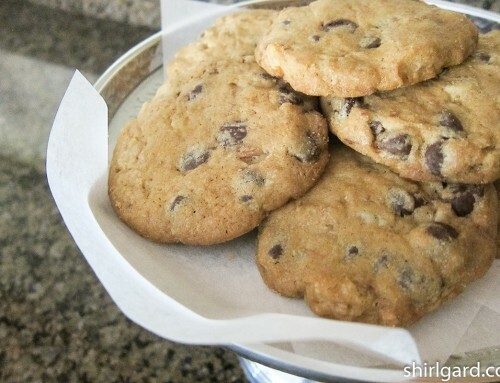 Finally, for learning, there’s almost no substitute for just going into the kitchen and making a batch. Then tasting, tweaking the recipe, making another batch, and tasting again. And having other people taste, whether it be family or other cooks in the kitchen. I made careful notes and when it was time to make a new batch of any given flavor, I would do a little fine-tuning from my notes. 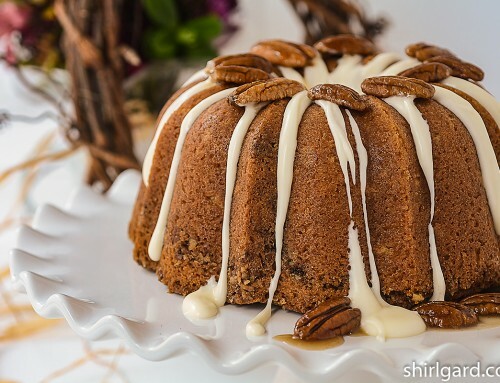 Over time, I developed solid recipes for a long list of many different flavors. All of this was possible because the chef at the Old Inn, Peter Platt, bought us a wonderful Carpigiani batch freezer. Most of the gelato we made was for the restaurant menu at The Old Inn On The Green and for scoops and pints to be sold at The Southfield Store (our bakery café just down the road from the inn), with small quantities being sold wholesale to a few local stores. In 2009, Yankee Magazine named Shirl’s Gelato at The Southfield Store in Southfield, MA the best gelato in New England. And now, the journey continues: my passion for gelato is being re-directed toward the creation of gelato recipes that you and I can make at home. From the beginning, as I mentioned above, one of the things that really intrigued me about the gelato-making process was the concept of making a basic gelato mix and using it as a base to create many different flavors. That is the concept that I used professionally, and am also following here, with the creation of Shirl’s Gelato Mix. If you master this gelato mix, it will open up a whole world of gelato, because, from here, my plan is to keep posting new flavors as I get them developed. First up will be Mango Vanilla Gelato, then Strawberry Gelato, Chocolate Truffle Gelato, and Black Raspberry Gelato. Stay tuned for more flavors after that. Even though this question has been asked and answered many times, I think it is important to answer it again: According to Google Translate, Gelato in Italian means “frozen”, “icy”, or “frosty”; but it also means “ice” or “ice cream”. Italian-style ice cream—Gelato—is different when compared to American ice cream in several significant ways. Gelato is generally lower in butterfat than ice cream. A basic Gelato Mix, from which most gelato is made just by adding different flavoring ingredients, ranges from 6% – 8% butterfat; ice cream bases range from 10% – 14%. Shirl’s Gelato Mix is in the 8% range, considerably less than ice cream. This is because Gelato Mix is generally made using more milk and less cream than ice cream. Shirl’s Gelato mix uses 80% milk and 20% cream. Traditionally, most premium ice cream is made using 50% milk and 50% cream. Another factor contributing to a lower fat content is that most (there are exceptions) gelato contains no egg yolks, while most premium ice cream is made from a custard base containing a lot of egg yolks. Shirl’s Gelato Mix contains no egg yolks, which along with the 80 / 20 blend of milk and cream, produces a lighter less heavy—but very refreshing—frozen dessert with fewer calories. Since fat tends to mask flavor, and gelato has less fat, the flavors of gelato seem more intense than ice cream. Ice Cream can have as much as 100% “overrun”, which is the term that defines how much air is whipped into the product during the freezing process. This technique (used by many inexpensive ice cream brands) increases the volume of the ice cream; the % refers to how much more volume the churned ice cream is versus the amount of ice cream base used. If you’ve had ice cream that tasted very fluffy, that’s high “overrun”. Gelato is a low “overrun” product of 20 – 25%, which means that the volume of your finished gelato is going to be just a little more than the amount of gelato mix that you started with. A well-made gelato is denser than ice cream because it has less air whipped into it. To help achieve this very desirable dense characteristic, several precautions are necessary. First, make sure that your flavored gelato mixture (Shirl’s Gelato Mix + Flavoring Ingredients) is very cold when you churn the gelato. (I put the finished mixture in the freezer for half an hour before spinning the gelato so that it is 32 ° F (0 °C) – 35 °F (2 °C) when it goes into the ice cream maker.) Second, if using an ice cream maker with a bowl that has to be frozen, make sure that it has been in the freezer overnight. Third, fill the ice cream maker container no more than half full. All of these things contribute to the gelato needing to churn for less time, which results in less air being whipped into it. Ice Cream is served right out of the freezer, so it is harder. Gelato is meant to have a soft and creamy texture, so let it sit at room temperature for about 10 minutes before serving. Luciano Ferrari says “Gelato is Ice Cream with Romance”. He is talking from a professional point of view about how gelato is an art, how it is made daily with the freshest of ingredients, how in gelato shops the pans of gelato are always creatively decorated, how it is made in small batches, and how it can be called “Artisan Style Italian Ice Cream”. I agree with all of this, but also, I fell in love with all of those romantic-sounding Italian gelato names: from Fior di Latte (flower of the milk) to Gianduia (chocolate hazelnut) to Lello (coconut almond), to Monte Rosa (strawberry), mentioned earlier, and many more. When made well, gelato is an irresistible frozen dessert. Once I tasted gelato and made it myself, I almost never made ice cream again. I definitely prefer gelato. I’ve been testing all of my gelato with an old-new Krups ice cream maker (the kind where you freeze the bowl) that I found in the basement. 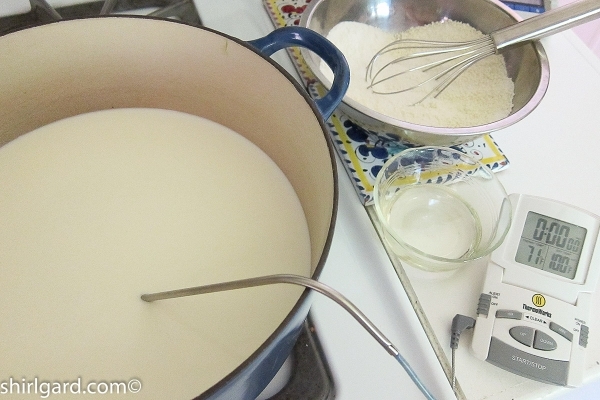 Although old, it was hardly ever used until recently, when I made ten batches of Shirl’s Gelato Mix to test and refine this recipe. It is o.k., but what I really want is a gelato maker with a compressor (no more containers in the freezer), one that is cold enough to freeze the gelato in a relatively short amount of time (under 30 minutes), and one with a blade that doesn’t whip in much air. Not asking for a lot here, right? To improve the quality of my gelato, a gelato maker is definitely on my wish list and I’m in the process of researching this. Anyone have any advice on this subject? This basic gelato mix is an ingredient in all of my gelato flavors, so if you master this mix, a whole world of gelato flavors will open up. Each flavor will call for 700g of mix, exactly half of this recipe. I will be working on new flavors and posting them from time to time. 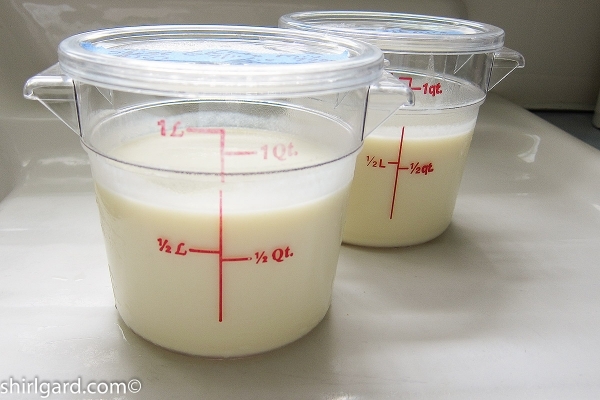 THIS FORMULA IS CALIBRATED IN QUARTS AND PINTS SO THAT THE DAIRY DOES NOT HAVE TO BE WEIGHED. 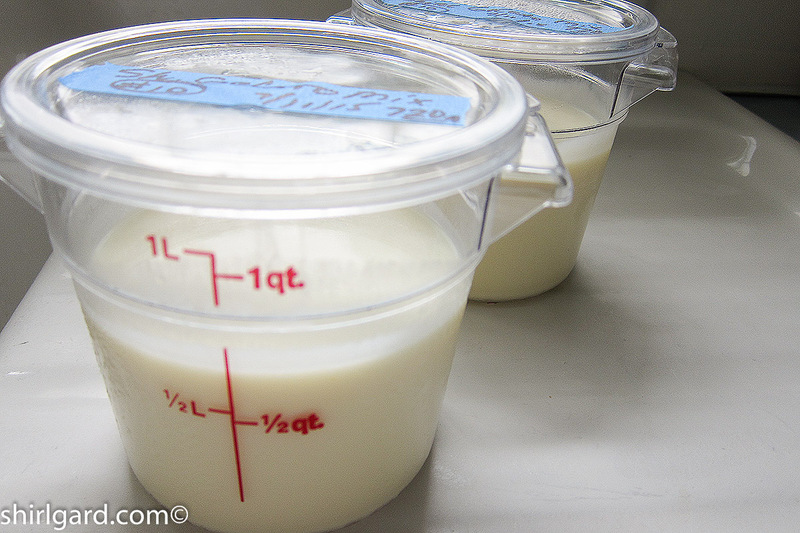 THIS IS AN 8% BUTTERFAT FORMULA: 80 % Milk / 20% Cream. YIELD: ABOUT 1440g (5½ cups) TWO PORTIONS - 720g EACH (2¾ cups). 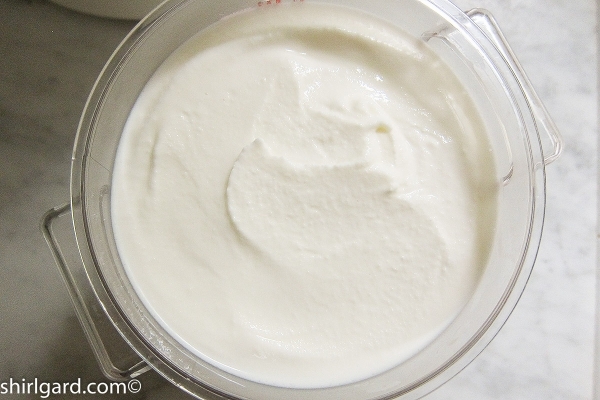 MAKES ENOUGH GELATO MIX FOR TWO (3/4 TO 1-QUART) BATCHES OF GELATO WHEN ADDITIONAL FLAVORING INGREDIENTS ARE ADDED. 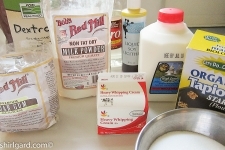 Mix milk, cream, and corn syrup together in a small Dutch oven or heavy pot. 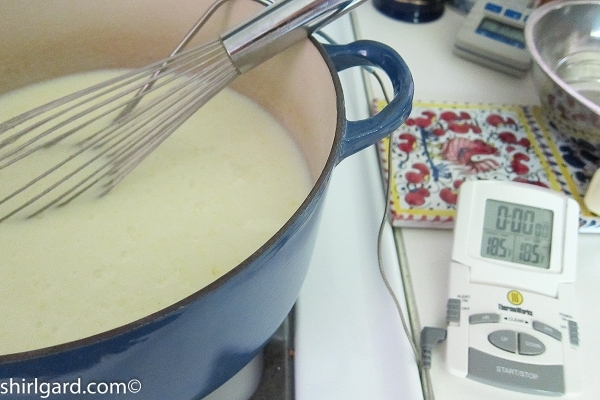 Insert a probe thermometer into the liquid and heat over medium heat just until warm to 100° F (38°C), whisking constantly. 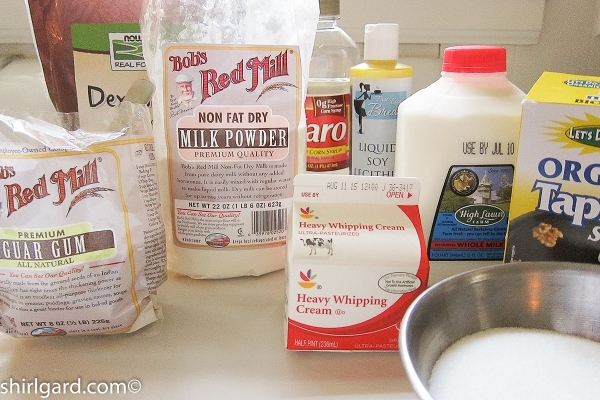 Before starting to heat the milk and cream, mix sugar with the other dry ingredients and whisk to blend. 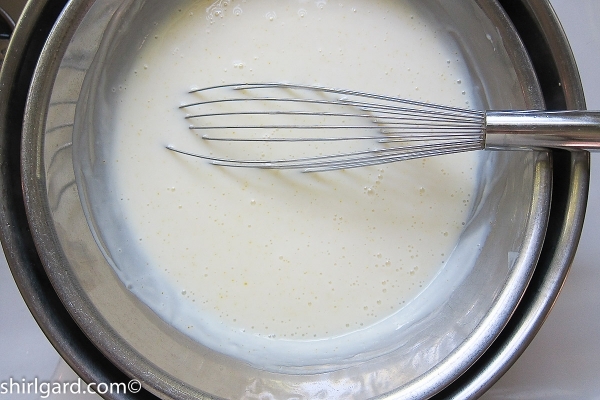 When milk / cream mixture reaches 100° F (38°C) and before 120°F (48°C), slowly drizzle in the dry mixture, whisking constantly. Heat to 185°F (85°C), (Do Not Boil) remove from heat, and cool down to room temperature in an ice bath. 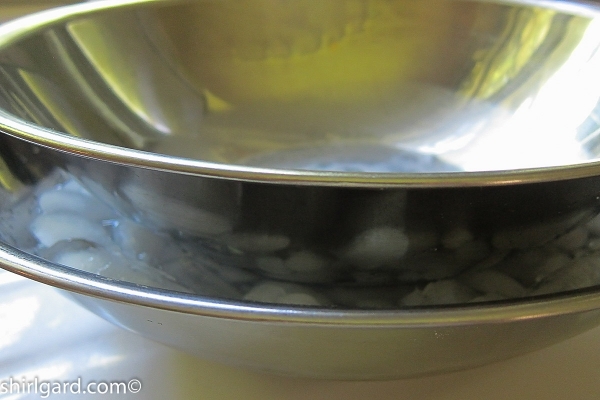 To set up ice bath: Fill a large bowl half full with ice and add a little water. Place a smaller bowl into the ice water. 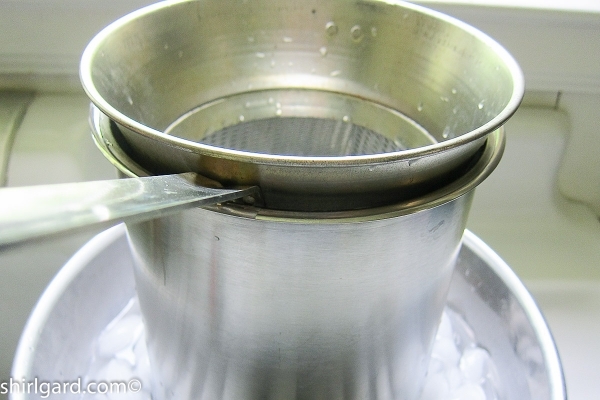 Have a strainer available to strain the cooked gelato mix into the small bowl to chill. Stir occasionally. 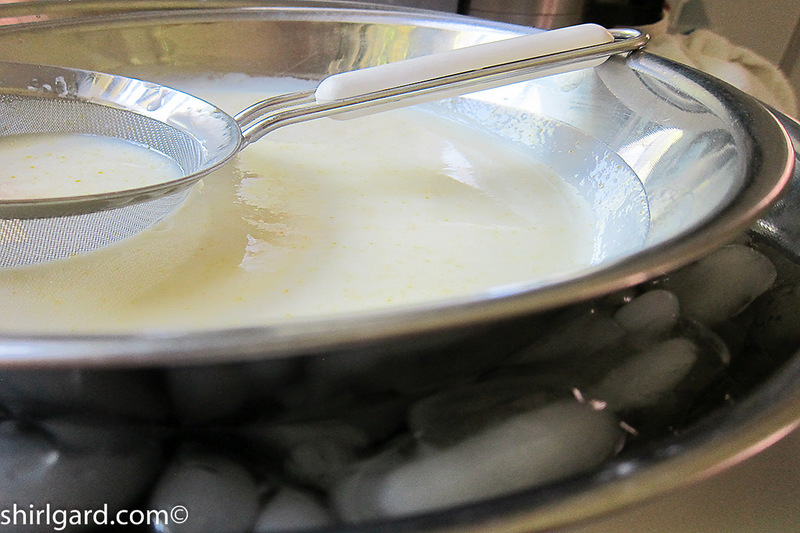 Alternately, use a chinois and strain the gelato mix into a bain marie, using a 1-oz ladle to push the mix through. 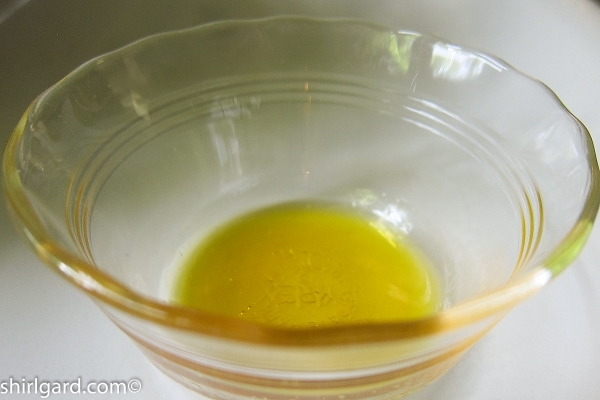 When gelato mix is cool, stir a little of the mix into the liquid soy lecithin, then whisk into the bowl of gelato mix. 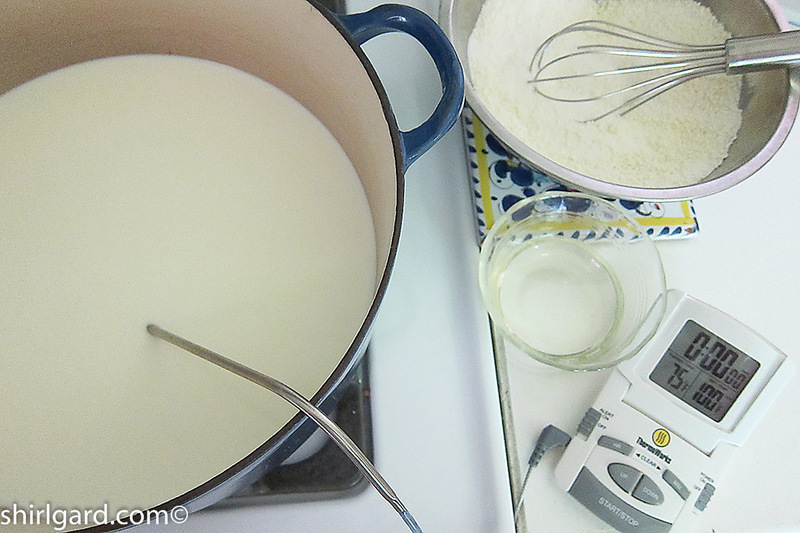 Blend with an immersion blender. Divide the gelato mix into two portions - 720 grams (2¾ cups) each. Refrigerate overnight, to age, prior to use. 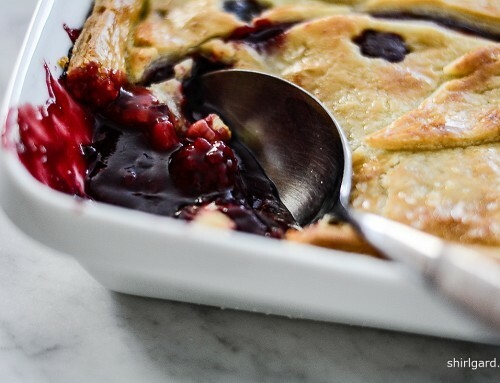 Ageing is very important because it allows the dry ingredients to be completely absorbed by the liquids and the ingredients to meld for better flavor. This also insures that the gelato mix will be very cold when ready to churn. When ready to use, mix well with whisk until smooth. Always use when very cold. The gelato mix will keep in the refrigerator up to 10 days, so it can be made ahead. 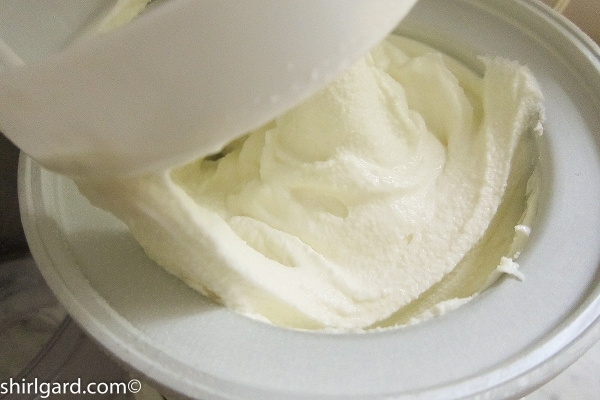 All of Shirl's gelato recipes will call for 700g of Shirl's Gelato Mix, so this recipe will make two batches, ¾ to 1 quart each, depending on the quantity of flavoring additions that are added to it.